There is one good thing that we can say about TruMoo’s holiday-themed flavored milks, and that is that they don’t have any high fructose corn syrup. Also, while the orange milk is orange-colored and Halloween-themed, it is not pumpkin spice flavored. After that, we’re pretty much out of nice things to say about it. Sugary holiday dairy beverages are nothing new, of course: this past spring, we brought you the terrifying vision of Easter Egg Nog and jellybean milk from Hiland. Maybe the real horror of this orange-colored and orange-flavored TruMoo isn’t that it exists, or that it looks like a half-gallon of orange juice in the clear plastic jug, but that this isn’t the product’s first year on the market. Nope: Brand Eating, the site that alerted us to this horror, says that it was around last year, too. The milk is called Orange Scream, because of course it is. It’s orange vanilla flavored: sort of a melted Creamsicle in a bottle, except not really. 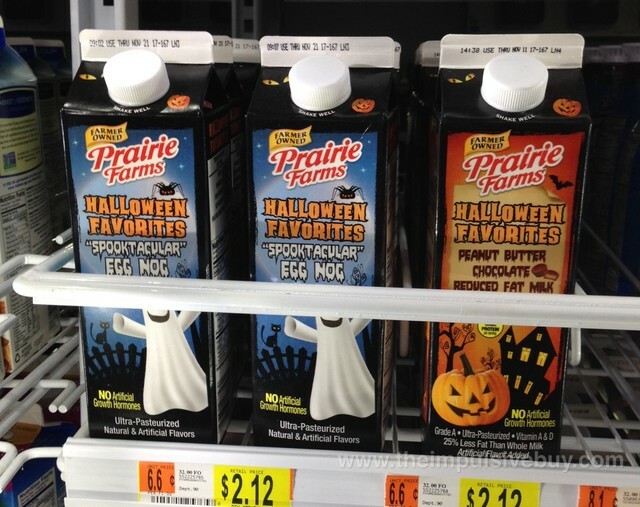 Meanwhile, Hiland and Prairie Farms don’t want to be left out: they have their own holiday milks in the form of “spooktacular” egg nog and chocolate peanut butter-flavored milk, all with Halloween-themed packaging. If holiday delicacies like egg nog are available year round, doesn’t that mean that special holiday foods are no longer special? Egg nog all year long!